The title of yesterday’s Life for Leaders devotion was “Give Yourself Completely to God, Not Your Work.” God alone is worthy of our worship. To God alone should we submit all that we are. Only God deserves our full allegiance and dedication. Work doesn’t have to be an idol competing for God’s sovereignty over our lives. Rather, it can be an offering of worship to God, one that responds to and honors his sovereignty. As I said yesterday, it is certainly tempting for some of us to give ourselves completely to our work, to make work the Number 1 priority for our lives, thus displacing God. But, I don’t want to imply that our work is somehow necessarily opposed to our worship. In fact, if we pay attention to all that Scripture says about work and worship, we discover that one of the major ways we can worship God is through our work. In Tuesday’s devotion, I noted that the biblical language for worship is based on the image of bowing down before a human sovereign. When we worship God, we offer ourselves fully and humbly to God, honoring him in our submission. But there is another, related word group for worship in Scripture. We see this in Psalm 100:2, for example: “Worship the LORD with gladness.” The verb translated here as “worship” is abad (sometimes transliterated as avad). Psalm 100 calls us to “worship” or “serve” the Lord through joyful shouting and singing. But abad has a wide range of meaning in the Old Testament. If we look back to Genesis 2:15, for example, we see that God put the man in the Garden of Eden “to work it and take care of it.” The verb translated here as “work” is abad. Thus, the biblical language of worship points to the fact that through our work we can worship God. The biblical story makes the same point, again and again. Since God created us so that we might work (abad), we can honor God’s intention and worship (abad) God through our work. Work doesn’t have to be an idol competing for God’s sovereignty over our lives. Rather, it can be an offering of worship to God, one that responds to and honors his sovereignty. The fact that our work can be either an essential element of our worship or an expression of idolatry that displaces God or, as may often be the case, a mix of both, makes us wonder how we can know whether our work is worship or not. In fact, one of the readers of Life for Leaders sent me an email a few days ago asking this very question. In future devotions I’ll offer some of my thoughts in response. For now, I’d like to encourage you to reflect on your own life, work, and worship in light of what we’re seeing in Scripture today. If God intends our work to be an essential element of our worship, how can we actually work in a way that worships God? Are there times when you are able to offer your work to God as worship? What makes this possible for you? Are there aspects of your work that seem far removed from worship? How might these be a genuine act of worship? In your opinion, when does work slip from worship of God to idolatry? When are we worshiping our work rather than God? Gracious God, you have made us and saved us to live for the praise of your glory. We are meant to worship you with all that we are, including our work. Thank you for the opportunity both to share in your work in the world and to worship you through our work. Lord, we recognize, however, our tendency to make work something more than a way to worship you. We can give ourselves so completely to work that we make it an idol. Work becomes our Number 1 priority, our primary purpose in life. Forgive us when we do this, gracious God. And teach us how to work for you and your purposes in all we do. Help us to worship you in our work. 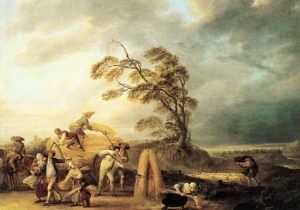 Image Credit:The Storm by François-Louis-Joseph Watteau. Oil on Canvas, second half of 18th C. Musée des Beaux-Arts, Valenciennes. Public Domain. ← Is Work Always Worship?